The issue of Private Eye for this fortnight, 18th – 31st March 2016, also has a little piece on the long series of lies uttered, if not spouted, by Ian Duncan Smith. It’s in response for Smith claiming in the pages of the Daily Mail that the opponents of Brexit are using ‘spin, smears and threats’. Which of course, the Dishonourable Member would never do. Except that he has. Frequently. When he was running for the leadership of the Tory party in 2001, he claimed that he had turned down offers of a place in the government so as to be able to continue opposing the Maastricht Treaty. His memory must have been playing tricks on him, because John Major, the Prime Minister of the period in question, stated that he never offered aIDS a job. Smudger’s office then issued a ‘clarification’, admitting that he had really only been offered the job of parliamentary private secretary – which the Eye describes as ‘the lowest form of unpaid bag carrier’ to Jonathan Aitken by one of the Tory whips, Greg Knight. Then in 2002 Michael Crick from Newsnight had a peek at the Quiet Man’s claim on his CV at the Tory party website to have gone to Perugia University. Er, no, he didn’t. He went to another educational institution there, but didn’t complete his exams and didn’t get a diploma. He was also criticised by the head of the UK Statistics Authority, Andrew Dilnot, for claiming that 8,000 people, who would have been affected by the benefit cuts, have been moved into jobs, and that this demonstrated that the cap was working. Dilnot said instead that this was false, and not supported by the official statistics from his department. The Eye then proceeds to discuss the decision of one of the judges at the administrative appeals chamber, Nicholas Wikeley, which upheld the judgement of the lower tribunal that the DWP should issue details from the report on how his Universal Credit project was progressing. The Eye notes that this was the third such legal judgement that had been made. Smiff has tried to fob the public off with the excuse that the report’s publication on why the project is overtime and over budget would have a ‘chilling effect’ on its operation. Wikeley instead stated that the Gentleman Ranker had offered no such evidence for this. Mike’s covered the Ranker’s long history of lying and fantasising over his blog, and the Eye’s article is yet another public reminder that IDS is congenitally incapable of telling the truth. Perhaps there should be an award given to the most flagrant and prolific liar in the Tory party, just like there is the Orwell Prize for the best literary work on politics. I suggest we call it the Archer Prize for Fictional Politics. 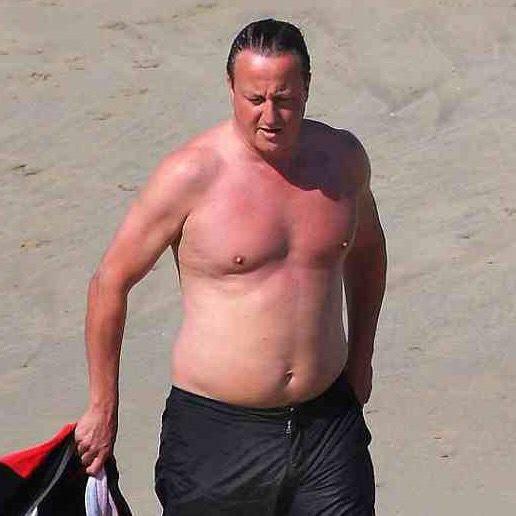 David Cameron, showing off the toned physique for which the Tory front bench is known. The Conservative Party seems determined to sink itself into the deepest, blackest hole ever created by a political organisation for itself. While other parties unveil attractive policies designed to bring voters onboard, the Tories have said they want to remove benefits from people they have decided are fat. Here’s the Independent story, and for good measure we’ll throw in the BBC‘s coverage too. You might be thinking to yourself, why not? They’ve already attacked people on Jobseekers’ Allowance, ESA and DLA as scroungers; they’ve pushed pensionable ages back by years; and they’re about to attack people who are on pensions, already. Why not continue proving what a bunch of spoiled little schoolboys they are by picking on fatties as well (oh, along with druggies and alkies)? He notes that the British Medical Association attacked the plans of Westminster Council to deny overweight people benefits on these grounds in 2013 as ‘draconian’. “It is not fair to ask hardworking taxpayers to fund the benefits of people who refuse to accept the support and treatment that could help them get back to a life of work,” he said. The good folk of the Twitterverse are much less impressed. One of these is John Wight, who commented that it was ‘a wheeze designed to appeal to the smug middle classes’. It is. And it shows the arrogance, the preening sense of superiority of Cameron and his crew, as they sneer at those they consider to be physically as well as socially inferior. And lying even further underneath is the assumption of the feudal elite that we are chattels, and they should have absolute control of our bodies as well as our labour. Private Eye published a revealing piece of gossip about the sneering mentality of the Tory grandees towards the plebs back in the 1990s. One of their contributors or spies had been at the special dining hall set up for the very rich at the Cheltenham Festival that year. This was lavishly laid out with the very finest cordon bleu cuisine. In the room at the time was one of the Tory bigwigs. I’ve got a feeling it was Lord Archer of Weston-Super-Mud, but I can’t be sure. The Tory looked out of the window at the rest of the crowd below, eating the meals they’d bought from the burger stand. ‘Oh, look at all those people with their little bits of plastic,’ he sneered. Now this is, of course, as Mike points out, deeply hypocritical considering the physiques of many of the Tory party. 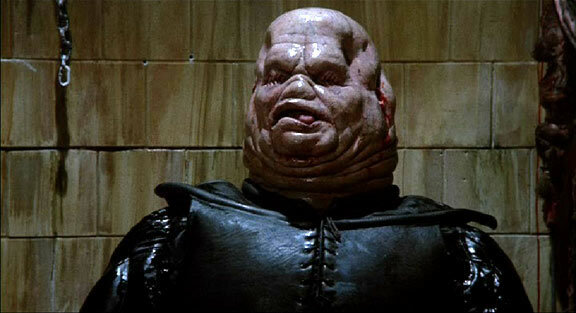 Like Nicholas ‘Fatty’ Soames, or Eric Pickles, who looks to me like nothing less than the ‘Butterball’ Cenobite from Hellraiser. And whatever it is about, it’s really not about getting the nation healthy or back to work. There are ways you could get people to eat healthier food by changing the way people shop and work. One suggestion was to label very clearly the fat content on foods, so that people were aware of just how many calories they were putting in their bodies. One other suggestion was to levy a ‘fat tax’ on fatty, unhealthy foods, like pizzas, fish and chips and so on. You could also encourage people to eat better by bringing back local shops close to where they live, rather than supermarkets to which they have to drive. This was brought out in one of the series with Jamie Oliver, where he went to one of Britain’s fattest cities to encourage the townspeople there to lay off the chicken McNuggets and eat their greens and muesli instead. One of the mothers he enlisted in his campaign actually burst into tears about this. She bought her kids KFCs and McDonalds, not because she was lazy, but simply because that was all she could afford. She could not afford to travel outside her area to go to the supermarket to buy the super-healthy greens and foods Jamie was recommending. And there’s also another, emotional reason why the very poor and the unemployed eat fatty foods: they make you feel better after another depressing, dispiriting day. This was discussed again back in the ’90s by the American broadcaster and columnist, Joe Queenan, and his guests on the Radio 4 show, Postcard from Gotham. This was the time when the news had just broken that America had an obesity epidemic. They noted that, in contrast to Britain and Europe at the time, America really was the ‘land of plenty’, where the food portions were massively bigger. But they were aware that the poor ate badly because of the miserable condition of their lives. Now the last thing the Tories actually want to do is start putting taxes on food, or have the fat content, or anything else in them clearly labelled. Many Tory MPs have very strong connections to the food and drinks industry. It’s why, for example, John Major’s government did precious little about dangerous alcohol consumption for so long, and consistently blocked legislation to limit consumption. That’s state interference, which is by nature Wrong and Oppressive. Worse, it may damage profits. Similarly, blocking supermarkets and encouraging a new generation of Arkwrights to set up their own, s-s-small businesses, as greengrocers, family butchers, bakers and so on is another idea that definitely ain’t going to get anywhere with the Tories. Not when the supermarkets seem to be on the march everywhere, driving out their smaller competitors. And this is before we get to the way successive administrations following Maggie have sold off public sports facilities, like school playing fields, public baths and sports centres. Private Eye has again been covering this scandal for some time in its ‘Levelling the Playing Fields’ column. This has been such as scandal that even the arch-Tory Quentin Letts has pilloried it and the Tory minister responsible in his book, 50 People who Buggered Up Britain. All of this means challenging vested commercial interests, and reversing decades-old developments in the way people work, exercise and shop. It’s expensive, would require careful thought and planning, and could take years. Besides, it would attack the very industries that fund the Tories and provide their MPs with an income. It’s far easier for them to do absolutely nothing, and go back to doing what they do best: sneering and attacking the poorest. It’s no surprise that this move also came two years ago from Westminster Council. The Tories there have been on a very long campaign to cleanse the area socially of the poor. In the 1990s there was the ‘Homes for Votes’ scandal, where the leader of the council, Tesco director Dame Shirley Porter, and her minions arranged for good Tory voters to be housed in good building, while the poor were removed to an asbestos-ridden tower block. This seems to be have been another ruse to drive the lower class and poor out of the area, so they could keep it as a low council tax, pristine area for the very rich. And ultimately, behind all this – the class snobbery about the bodies of the poor and the poor quality foods they consume, is an even more sinister, essentially feudal assumption: that the slave master should have absolute control over the bodies and physical fitness of his slaves. During the slave trade, the captains of the slave ships during the long journey across the Atlantic to the Caribbean and America would take their slaves up on deck and make them exercise. This was to keep them just fit enough so that some of them might survive, and fetch a good price. Once there, the slaves could be seasoned for a year so that they could recover and be fit enough to be a worthwhile commercial investment for their purchasers. That statement by Cameron about it not being fair to ask ‘hard-working’ people to fund people who are too fat to be available for work shows something of the same mentality. It’s the attitude of the feudal lord complaining about the laziness of his peasants. John Locke, the founder of modern liberal political philosophy certainly was no opponent of slavery. He worked for the Board of Plantations when the English government was expanding their colonies in America and the Caribbean. The constitution he drew up for Carolina was strongly feudal in character. Nevertheless, he believed that free people should have absolute control over their bodies, to the point where military commanders could only ask troops to risk their lives, not command. This latest move by the Tories undermines this fundamental principle. It shows they still have the deep-seated feudal assumption that they have the absolute right to control the bodies of their serfs. I also wonder how far this new move is an attempt by the Tories to discredit the welfare state by being as totalitarian as possible in its name. For many Americans, the welfare state is just about synonymous with totalitarian Communism. A little while ago American Conservatives opposed to Obamacare were looking at the various campaigns of the Blair government to cut down on obesity in the name of saving the NHS money as examples of the totalitarian assumptions of the British welfare state. “Look! They actually tell you what to do at that level! That’s what Socialism is really like!” It looks to me that the Tories have taken over those arguments, and decided to act them out and push them as far as possible, in order to cut down on ‘welfare dependence’. And finally, let’s call out this latest measure for another piece of hypocrisy. Quite apart from the fact that the Tories have their fair share of gutbuckets, remember how the Daily Mail and the other Tory rags screamed blue murder when Blair’s government started trying to get people to be more health aware. Such as the various posters that were stuck up on hoardings up and down the country, telling you not to overdo the amount of salt you put in your food. They immediately shouted that this was the ‘nanny state’, and that it showed the overbearing, micromanaging mentality of New Labour. The Tories were against all that. They stood for sturdy self-reliance against such petty meddling with people’s personal affairs. Except now, they don’t. Not when it reinforces their middle and upper class prejudices. Not when it humiliates the lower orders even further. Not when they can deprive people of benefits, make the poor and sick starve, and force them out of house and home. Well, here’s a musical response to this. It’s the mighty Motorhead’s ‘Eat the Rich’. Enjoy! I just heard this little bit on the One Show, and it seemed a very telling sign of the post-Nixon state of British and American politics. There’s a bit in the film Whoops Apocalypse where the first female president of the USA goes in search of her predecessor to ask his advice on the current international crisis. The film shows the presidential limousine going up to a grand mansion. It then passes it, to stop at a group of convicts working on the road nearby. ‘Hi, Mr President’, the President calls from her car, ‘how’s life?’. ‘Still doing it’, replies one of the convicts. Nixon’s impeachment clearly influenced Douglas Adams’ when he was writing The Hitch-Hikers Guide to the Galaxy (still better selling than Celestial Homecare Almanac). In it, Zaphod Beeblebrox, the extremely laid-back and highly weird President of the Galaxy has spent one of his two presidential terms in jail for fraud. In the TV series, there was an advert for one of Beeblebrox’s products, running ‘Vogon Firelighters Never Go Out’. Now here’s another case of reality following art. Ben Miller was on the One Show to talk about his latest play, The Duck House. It’s based on the MPs’ expenses scandal of a few years ago. It’s hero is an MP, who flips his houses so that he can claim expenses, and employs his wife as his secretary and his son as his researcher so that he claim for them as well. The One Show then produced a few cases of what some of the real MPs got up to. This included a Labour MP, who fraudulently claimed £30,000 worth of expenses, and was jailed, and a Tory Peer, who was also imprisoned for falsely claiming £14,000. The former Labour MP has now disappeared from view, but the Tory Peer is now campaigning for prisoners’ rights and prison reform. Well, there’s nothing like personal experience. Clearly this has stopped one Tory claiming that jails are too soft on criminals. It also shows just how far political corruption and jailing of MPs is now almost commonplace, after Jeffrey Archer, Jonathan Aitken and the Hamiltons, not to mention the Libdem couple, have been sent down. ‘How’s life, Mr President?’ ‘Still doing it’ seems to sum exactly this state of affairs. Unfortunately, none of those jailed have been Blair or Cameron, at least, just yet.